ASSA ABLOY has acquired Spence Doors, a leading manufacturer of commercial doors in Australia. 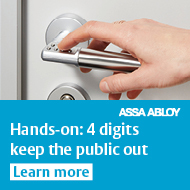 "I am very pleased to welcome Spence Doors and their employees into the ASSA ABLOY Group. This acquisition delivers on our strategy to strengthen our position in the mature markets through adding complementary products and solutions to our core business,” says Nico Delvaux, President and CEO of ASSA ABLOY. “Spence Doors is an excellent addition to the Asia Pacific Division and complements our existing door opening solutions offering for our customers. The acquisition provides potential to accelerate our growth utilising their comprehensive footprint around Australia”, says Anders Maltesen, Executive Vice President of ASSA ABLOY and Head of Division Asia Pacific. Spence Doors was established in 1951 and has approximately 260 employees. The main office is located in Melbourne, Australia. Sales for 2019 are expected to reach about AUD 67 million (approx. SEK 435 million) and the acquisition will be accretive to EPS from start.